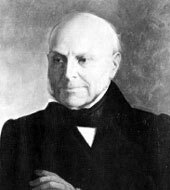 John Quincy Adams was appointed Secretary of State by President James Monroe on March 5, 1817. He served from September 22, 1817, until March 3, 1825. Adams enjoyed unique training in diplomacy and became one of the most influential diplomats in U.S. history. The son of President John Adams, John Quincy Adams, was born in Braintree (now Quincy) Massachusetts. In 1778 he traveled to France with his father, who was then U.S. commissioner to France. On this and subsequent visits to Europe, the young Adams studied at academies and universities. At fourteen Adams became private secretary to Francis Dana, the U.S. Minister to Russia; Adams also served as secretary to his father during the negotiations of the Treaty of Paris that ended in 1783. In 1787 the twenty year-old Adams graduated from Harvard University. After studying law, he gained admission to the bar in 1790 and began practicing in Boston. Almost five decades of public service began in 1802 when Adams gained election to the Massachusetts Senate. In addition to numerous diplomatic appointments, Adams went on to serve as U.S. Senator from Massachusetts from 1803 to 1808, U.S. President from 1825 to 1829, and U.S. Representative from Massachusetts from 1831 to 1848. Adams’ unsurpassed diplomatic career addressed the major foreign policy challenges of his time. President George Washington appointed him U.S. Minister Resident to the Netherlands in 1794. After serving three years in the Netherlands, Adams became U.S. Minister Resident to Prussia from 1797 to 1801, appointed this time by his father. President James Madison appointed Adams U.S. Minister to Russia in 1809, and Adams served until 1814. He duly reported on Napoleon’s failed invasion, among other events. Adams headed the Commission that negotiated the Treaty of Ghent in 1814, which ended the War of 1812 with Great Britain. His placement as U.S. Minister to Great Britain from 1815 to 1817 insured that he would be central to the ongoing efforts to improve Anglo-American relations. He concluded the Commercial Convention of 1815, which included a mutual import non-discrimination measure that would serve as a model for future trade agreements. Adams helped start negotiations to disarm the Great Lakes that culminated in the Rush-Bagot Pact of 1817. He also guided the progress of the Convention of 1818, which set the boundary between the United States and western British North America (later Canada) at the Rocky Mountains and stipulated joint occupation of the Oregon Country, among other issues. As Secretary of State, Adams’ views about territorial expansion guided President Monroe’s policies. Adams’ brilliant diplomacy with Spain, which led to the Adams-Onís Treaty of 1819, was largely responsible for the Acquisition of Florida and the U.S. assumption of Spain’s claim to the Oregon Country. Adams worked to delay U.S. support of the new Latin American republics until the treaty was ratified. By 1822, however, he supported President Monroe’s recognition of several new republics. The following year, Monroe announced the Monroe Doctrine, which reflected many of Adams’ views, particularly his insistence that the proclamation be unilateral. Adams also achieved a favorable convention with Russia in 1824 that recognized the U.S. claim to the Oregon Country. Foreign affairs were not central to Adams’ presidential term. As a Representative from Massachusetts, however, Adams ended his great drive to expand the territory of the United States. His disapproval of the expansion of slavery led him to oppose the annexation of Texas and the war with Mexico. Alternatively, Adams supported President James K. Polk’s efforts to annex the Oregon Country. Adams believed that slavery would not reach Oregon and that the coastal territory would benefit foreign trade. Continued to serve, without reaccreditation, after the proclamation of the Batavian Republic. Did not serve under this appointment. Commissioned to Prussia; resident at Berlin. Commissioned to the court of the Prince Regent of the United Kingdom of Great Britain and Ireland.